Mission Santa Inés. Courtesy of Santa Barbara Mission Archive-Library. Established late in the mission era and the last of the Southern California missions, Mission Santa Inés was dedicated number nineteen in the chain on September 17, 1804 by Father Estevan Tapis. Named after Saint Agnes and nestled in the Santa Ynez Valley, the missions proximity to the Danish town of Solvang makes for an interesting blend of cultures. The mission was originally going to be located in California’s interior near the San Joaquin Valley, but the plan was abandoned. 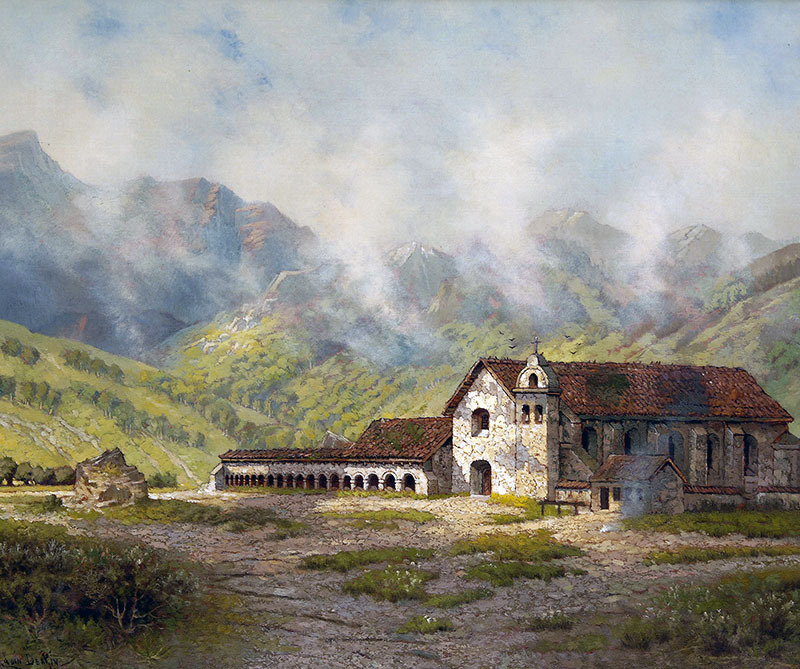 Designated “Mission of the Passes”, to arrive at Mission Santa Inés, visitors had to battle the San Marcos Pass, take the Refugio Pass or the Gaviota Pass, otherwise known as El Camino Real. This isolation discouraged visitors to Santa Inés, and consequently the missions social life was limited. Prosperity at Mission Santa Inés was halted by several occurrences, such as the great earthquake of 1812 and the Chumash revolt of 1824 when the Indians aggressively protested treatment by the military guards. During secularization, the mission was rented to the Covarrubias family for five hundred eighty dollars a year. The missions Madonna Chapel, featuring its bright and vibrant colors has benefited from dedicated restorations. Begun by Father Alexander Buckler in 1904, ongoing repairs to the mission have allowed Santa Inés to recapture the splendor of its earlier days. Buckler enlisted his niece, Maime Goulet, to restore the missions art and vestment collections that today make up an extensive museum. As in mission days, the church remains an active parish and the surrounding countryside is a popular wine region. From US-101 : Exit CA-246 and proceed east (approximately 14 miles). Tours - 9am - 4:30. Please call 805-688-4815 for more information.